"Hi there! I'm Marnie! I am so happy you're here. I know you will find this course useful to your homeschool journey. I bring together everything I've learned over the years as an AMS Montessori trained teacher & parent plus coaching and community to support and encourage you. Remember, I will be with you every step of the way. You can do this!" To learn more about Marnie, check out her website Marnie Craycroft. You can also find her active on Facebook. To run a profitable blog, you must monetize your email newsletter. In a day and age where the algorithms keep changing and brands all too often undervalue a blogger's influence, your email subscriber list needs to be a driver of building your business and succeeding in an online world. No longer can bloggers rely on page views as the driver of revenue. Meet Jane, your newest email subscriber. Here is the deal, though, email marketing strategy is not simply about numbers and conversions. Email marketing needs to be about building relationships, nurturing your reader, and truly connecting with your subscriber. Not many email marketers embrace this face quite yet and it is going to hurt them. If you choose to embrace this unique approach to email marketing, your conversions will come and your business will grow. My course introduces a relationship management strategy, not simply an email marketing strategy. In addition to big-picture philosophy, my course gives you the tools, tactics, and resources to truly succeed. I've taken everything I've learned from over a decade working in corporate relationship management and nearly ten years as a professional blogger and brought it online for you. There are several modules covering everything from defining your email marketing goals to creating your email marketing campaigns to strategies for segmenting your subscriber list to the technical aspects of email marketing. 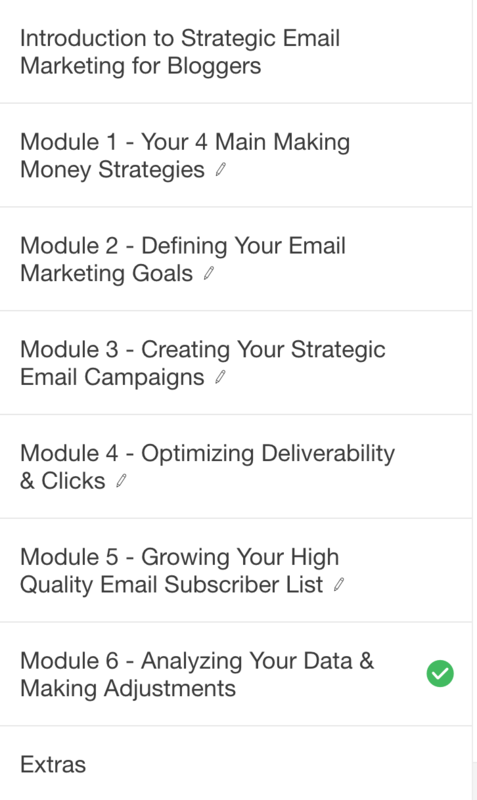 Each module has several lessons, resources, and exercises to get your email marketing strategic plan in place. 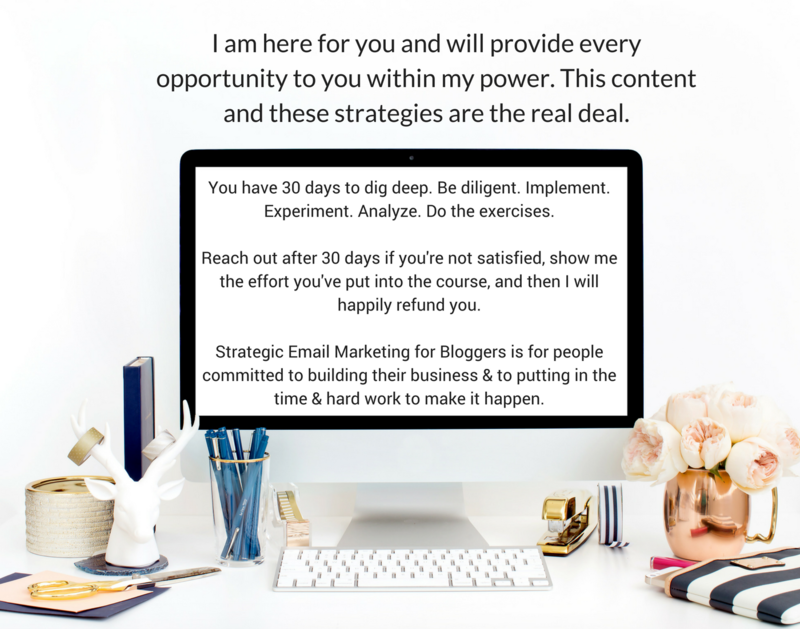 At the end of this course, you will monetize your email newsletter like you never imagined possible...and this is only the beginning. How does lifetime access sound? After enrolling, you have unlimited access to this course for as long as you like - across any and all devices you own. In addition, you have lifetime access to content and course updates. The content will be "dripped" out to you on a week by week basis. So, at the end of the course, you will have access to all modules. Before that time, in sequential order, the modules will become available to you. It is a completely self-paced online course - you decide when you start and when you finish each module. Are there any assignments or requirements to the course? Nothing is required. There are exercises and assignments but it is all SELF-PACED. The benefits are the community and the lifetime access to the content. I provide quizzes for those students wanting a certificate of completion for the course. Is it possible to earn a certificate for this course? Yes. I can offer you a certificate of completion. Is the course instructor led? Yes and no. I'm here for support but this course is self-paced. In addition to having access to me via email and online forums, you are a part of a robust community as a tremendous resource.